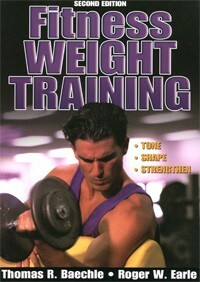 Fitness Weight Training, 2005, 2nd ed. • Recommended for: It is targeted to consumers, albeit, those who are a little more serious about weight-training than the average weekend warrior. • Thomas Baechle, EdD, CSCS is the executive director of the National Strength and Conditioning Association (NSCA) Certification Commission. He is the cofounder and past president of NSCA and its former director of education. He is also chairman of the exercise science and athletic training department at Creighton University. For 16 years, Baechle competed successfully in weightlifting and powerlifting. He also coached and taught weight-training classes. He was instrumental in the creation of the CSCS and the NSCA-CPT certification examinations offered by NSCA. He has authored 10 other books that have been translated into 10 languages. • Roger Earle, MA, CSCS is the associate executive director and the director of exam development for the NSCA Certification Commission. In collaboration with Baechle, Earle is responsible for reviewing and editing the CSCS and NSCA-CPT exams. Earle has been a personal fitness trainer for nearly 20 years. He received his masters degree in exercise science from the University of Nebraska. He has been a strength coach and a faculty member at Creighton University for 9 years. The book starts with a brief summary of the major muscles of the body and describes the different types of weights and weight machines. From there, the authors walk the reader through the process of assessing their fitness level. The "Physical Activity and Readiness Questionaire" (PAR-Q) and a chart summarizing fitness norms for the bench press test are provided in Chapter 3. The discussions are brief and each chapter is supplemented with subheaders, tables, and black and white photos to make the book visually appealing. The photos show average people (not freakishly huge body builders) of all ages performing the various exercises. Photos of people performing stretches are also provided. • What I Liked About This Book: One of the strengths of this book are the 75 specific workout routines. Each routine summarizes the muscle group being exercised, the number of reps and sets, and options for performing the respective exercise on either free weights, a cam machine, or a pivot machine. This is a very nice feature, as it gives different approaches to any particular exercise. • What Could Be Better: My only criticism of this book is that the discussion of the relationship between the amount of weight and the number of reps doesn't appear until p. 195. In my opinion, chapter 11 "Design Your Own Program" should be one of the first chapters. Even though the authors are academics, they avoided creating a text that is bogged down with research data. They have produced a book that is very practical for the average person who wants to know the correct way to train with weights. In summary, I really like this book. It covers everything a novice weight-trainer needs to know and does so in an easy-to-read format without getting into too much research. I highly recommend this book for weekend warriors, older adults, and any others who want to begin a weight-training program.